When you Go Greek, you join a community of diverse individuals, with a variety of interests / majors, who are deeply committed to academics. Ohio Wesleyan is home to two honor societies for members of fraternities or sororities: The Order of Omega and Gamma Sigma Alpha. Since then, many institutions inquired about membership in the Order. They see it as a way to further the dedication to scholarship of the Greek organizations on their campuses. A national constitution was formalized and colonization procedures were developed to guide new chapters across the country. This constitution, charter documents, suggested rituals and regalia, and recognized membership certificates provide a consistent foundation for each chapter. The Order of Omega voted to become co-ed in the spring of 1977. At Ohio Wesleyan, it is open to all qualified affiliated men and women. Membership reflects academic excellence, and those chosen take the mission of the group, to highlight the commitment all Greek organizations have to academics, very seriously. 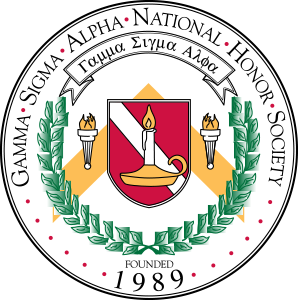 Gamma Sigma Alpha Honor Society (GSA) is a national organization (with local chapters) committed to the academic success of Greek members and alignment with the academic missions of the colleges and universities involved. Greek-affiliated students are eligible for membership based on grade point average and commitment to OWU’s academic missions. Only students with a cumulative grade point average of 3.5 or above (on a 4.0 scale) at the start of their junior year or a grade point average of 3.5 or higher in any semester during their junior or senior year are eligible.